Okay, really quick: Who is this nun? (hint: it’s not Sally Field). 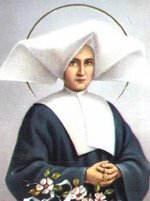 It’s St. Catherine Labouré, the nineteenth-century French nun who forever changed the face of Catholic accessorizing (with a little help from Mary, of course). You can read more about her, Mary, and the Miraculous Medal on BustedHalo.com. This entry was posted in Question Box. Bookmark the permalink.